A microfluidic device developed by Massachusetts General Hospital (MGH) investigators may help solve a significant and persistent challenge in medicine – diagnosing the life-threatening complication of sepsis. In their paper published in the journal Nature Biomedical Engineering, the research team describes how their device accurately diagnosed sepsis by measuring the movement patterns of the white blood cells called neutrophils from a single drop of blood. "We found that neutrophils from sepsis patients exhibit specific spontaneous migration patterns when tested in whole blood samples," says Felix Ellett, PhD, a postdoctoral fellow in the BioMEMS Resource Center in the MGH Department of Surgery, lead author of the study. 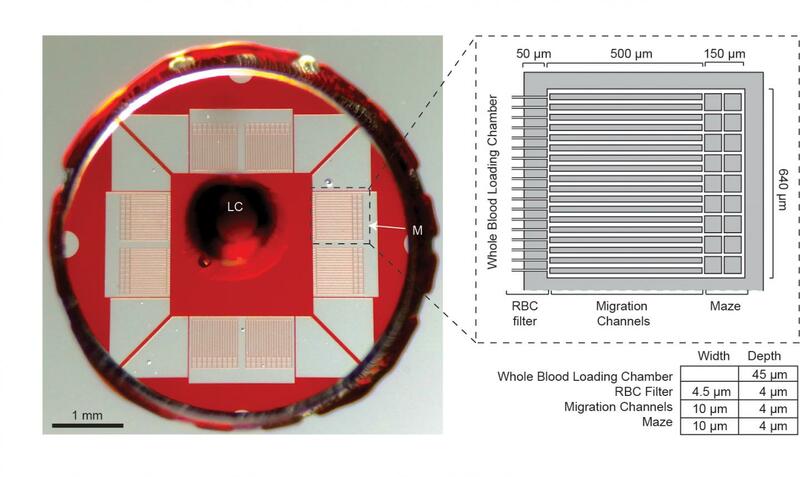 "During sepsis, factors present in the plasma of these patients induce neutrophils to migrate spontaneously when placed into the mazes of our microfluidic device, and we were able to identify migration patterns specific to sepsis." An out-of-control immune response that can damage organs and tissues throughout the body, sepsis affects more than one million U.S. patients each year, around 25 percent of whom do not survive. Current diagnostic methods are imprecise, and the condition is misdiagnosed in 30 percent of patients, leading to treatment delays that significantly increase the risk of death. It has been estimated that for every hour that sepsis diagnosis is delayed, the risk of death increases by almost 8 percent. Neutrophil dysfunction is known to be a hallmark of sepsis, and a 2014 study led by Daniel Irimia, MD, PhD, associate director of the BioMEMS Resource Center and senior author of the current study, found that changes in the movements of isolated neutrophils – including rapid, spontaneous motion not induced by a chemical attractant – could predict which patients were likely to develop sepsis. This led the investigators to hypothesize that measuring the spontaneous movement or motility of neutrophils in a whole blood sample could amplify the changes observed in that earlier study. The device they designed – around 5 millimeters in diameter – consists of a central chamber surrounded by filters that keep red blood cells and other blood components confined. Neutrophils are able to pass through the filters and enter a maze of channels within which their patterns of motion can be observed. By analyzing these patterns in blood samples taken from 23 intensive care patients at various times during hospitalization, the research team identified five neutrophil parameters – number of neutrophils, their oscillations within the channels, the time spent not moving, reverse migration back into the central chamber, and the average distance migrated – that could be used to develop a Sepsis Score that accurately discriminated samples patients with sepsis from those without. They confirmed these observations by testing samples from a separate group of 19 patients from a different ICU, and their results were more than 95 percent accurate in determining whether patients did or did not have sepsis. "Using blood samples taken from patients on the first day of hospitalization, the assay identified sepsis patients with very high accuracy" says Jarone Lee, MD, medical director of the Blake 12 Intensive Care Unit at MGH and a co-author of the report. "We believe that this approach may allow us to identify patients at risk of developing sepsis earlier than any current method." Additional studies of this assay in larger and more diverse groups of patients are now underway at the MGH. Irimia says, "The striking performance of the assay in this study brings into focus the fundamental role that neutrophils play during sepsis. Neutrophils have long been suspected of playing a role in sepsis, but until now tools for studying neutrophil function were rudimentary. The combination of new tools and the spontaneous, sepsis-specific motility we described in 2014 was essential to making diagnostic progress, and further studies may guide the development of treatment regimens that can correct neutrophil dysfunction and eventually prevent sepsis before it occurs." Irimia is an associate professor of Surgery, and Lee is an assistant professor of Emergency Medicine at Harvard Medical School. Additional co-authors of the paper are Julianne Jorgensen and Anika Marand, BioMEMS Resource Center; and Yuk-Ming Liu, MD, Myriam Martinez, MD, Vicki Stein, MD, and Kathryn Butler MD, MGH Department of Surgery. Funding for the study includes National Institute of General Medical Sciences grant GM092804, National Institute of Allergy and Infectious Diseases grant AI113937 and support from Shriners Hospital for Children.